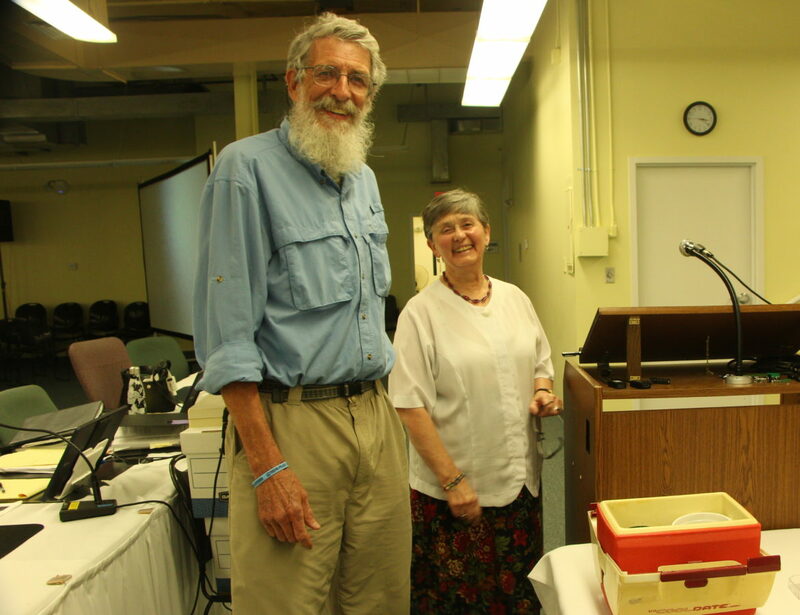 Barry and Gretchen Draper have attended many of the SEC hearings on Northern Pass and brought a petri dish with tadpoles from a vernal pool in New Hampton on Friday. CONCORD – With 42 hearing days already scheduled for Northern Pass Transmission to make its case before the Site Evaluation Committee, the project asked Friday for 15 more days to be sandwiched in during July, August and early September – and for evening sessions. Already, the subcommittee hearing Northern Pass’ application to build a controversial 192-mile high-voltage transmission line from Pittsburg to Deerfield, has held 18 full days of adjudicative hearings in Concord with two half-days for the public to comment since April 13. According to the motion filed by Northern Pass attorney Thomas Getz on Friday, many intervenors are opposed to at least part of the proposal. Some travel great distances from the North Country to attend the Concord hearings and have been planning testimony, exhibits and experts for months and sometimes years. Also on Friday, intervenors continued for the fourth day to cross-examine the project’s environmental panel about the impact of bringing 1,090 megawatts of electricity from Hydro-Quebec through New Hampshire to the New England grid. Grafton County Attorney Lara Saffo, representing the Grafton County Commissioners, questioned the panel about the requirement that full and timely consideration on environmental consequences be considered. “One of the issues we’ve been struggling with is the project seems to evolve over time. Do you understand what I mean,” Saffo asked panel member Bob Varney. Varney, the former EPA New England regional administrator, now works for Normandeau Associates, the firm hired by Northern Pass on environmental issues. “So it makes it kind of a moving target as far as putting our heads around the entire project …,” Saffo said. Varney said the project is continuing to work with homeowners, communities and interested parties as needed. Saffo asked panel member Lee Carbonneau, also of Normandeau Associates, if all of the environmental impacts were set forth in the project’s 2015 application. There have been changes since then, Carbonneau answered, adding the SEC and appropriate agencies have been kept up to date. “Do you anticipate doing that more in the future?” Saffo asked. Intervenors from Deerfield and New Hampton were also among questioners on Friday. Barry and Gretchen Draper brought some tadpoles and a salamander from a vernal pool in New Hampton to the SEC hearing in Concord on Friday. 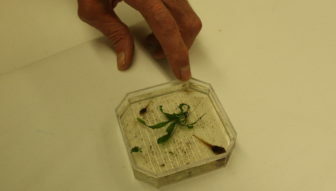 Barry and Gretchen Draper brought tadpoles in a petri dish from a vernal pool in New Hampton. Barry Draper also submitted pre-filed testimony as an intervenor with the Pemigewasset River Local Advisory Committee. The SEC has already extended the deadline for three months to Sept. 30 in which the committee must give thumbs up or down to the Northern Pass Transmission/Eversource Energy project. “The Applicants recognize the many challenges to the Subcommittee in conducting a proceeding of this magnitude and importance, including potential difficulties in assembling a quorum, as well as the challenges to the parties, many of whom are appearing pro se, in participating in such a proceeding,” Getz wrote. Over the many months of the proceeding, the schedule was adjusted for a variety of reasons, but by law the seven-member committee must be finished by Sept. 30. He went on to say that although nearly half the hearing days have been consumed, a number of the applicants’ witnesses have yet to be examined and all of Counsel for the Public’s and the Intervenors’ witnesses yet to be examined. Cross-examination has taken much longer than expected, Getz wrote. Getz said the IBEW supports the motion. He said the following parties oppose the motion, at least in so far as it seeks to extend the hours of hearings: Municipal Groups 1 South, 2, 3 South, and 3 North; Grafton County Commissioners; Counsel for the Public; the NGO Intervenors; Forest Society; PRLAC; National Trust for Historic Preservation; Deerfield Abutters; McKenna’s Purchase; Southem Non-Abutters, Ashland to Deerfield; Abutting and Non-Abutting Property Owners Bethlehem to Plymouth; Whitefield to Bethlehem Abutters; Non-Abutting Property Owners Stark to Bethlehem; Dummer, Stark and Northumberland Abutters; and, Combined Property Owners Pittsburg, Clarksville and Stewartstown. Some either do not oppose or support the motion insofar as it seeks additional hearing days in general but may not support the applicants’ specific request, including: Abutting Property Owners Bethlehem to Plymouth; Combined Property Owners Pittsburg, Clarksville and Stewartstown; and Dummer, Stark and Northumberland Abutters, Getz wrote. InDepthNH.org’s previous stories about the SEC hearings.